Cinema of Shadows is the first novel I have read by Michael West, but it won't be the last. Welcome to the Woodfield Movie Palace. The night the Titanic sank, it opened for business...and its builder died in his chair. In the 1950s, there was a fire; a balcony full of people burned to death. And years later, when it became the scene of one of Harmony, Indiana's most notorious murders, it closed for good. Abandoned, sealed, locked up tight...until now. Tonight, Professor Geoffrey Burke and his Parapsychology students have come to the Woodfield in search of evidence, hoping to find irrefutable proof of a haunting. Instead, they will discover that, in this theater, the terrors are not confined to the screen. I'm a big fan of all things ghostly. I love watching reality ghost shows like Ghost Hunters and Paranormal State or fictional ghost shows like Supernatural and The Ghost Whisperer. I've read more non-fiction ghost books than fiction ghost books, but I would still go as far as saying ghosts are my favorite subject matter. All of that to say Cinema of Shadows was right up my alley. I was hooked into Cinema of Shadows from the start. 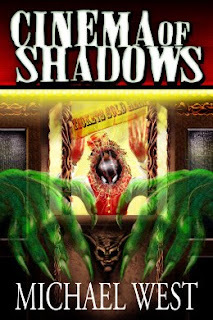 Michael West used a lot of common horror elements as well as common urban legends when building up the story and background of Cinema of Shadows, but there are certain tropes when it comes to hauntings and horror stories to which I may never grow tired. Once the action really got underway, Cinema of Shadows was an original and frightening story. I have some vivid images from inside Cinema of Shadow's Woodfield Movie Palace that will continue to haunt me (in a good way). The only complaint I had at first was everything seemed to be so ideal. The paranormal investigations and the characters' relationships all seemed too good to be true. By the end, however, I couldn't help but like the characters and root for them to survive. I'm a new fan of Michael West, and I look forward to reading more of his work. I wanna read it! I wanna read it! Very nice review. I've got this near the top of my to-be-read pile. Maybe I'll place it at the very top.